Habib Koité is a Malian musician, born in Thies, Senegal, in 1958. He grew up in a family of griots, who are story-tellers and musicians of the Khassonke ethnic group. Koité entered the Institute of Art of Bamako (INA) in Bamako, the capital of Mali, in 1978, and graduated in 1982. During that period, he directed the student orchestra. He was recruited as a guitar teacher at the end of his studies and remained there in that capacity until 1998. The musical career of Koité began in the late 1980s, and grow considerably in the 1990s. 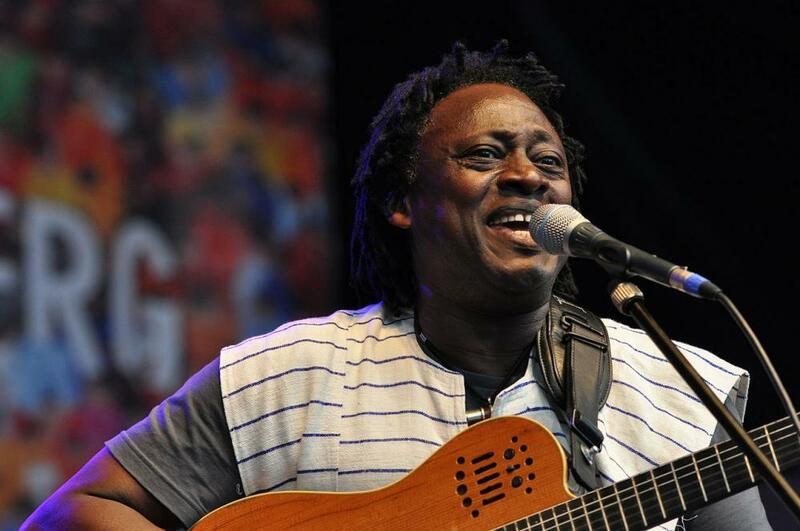 In 1988, he formed his first band, Bamada, which included Keletigui Diabate, an older and already famous Malian musician. Koité performed frequently around Mali and gained a national reputation. In the early 1990s Koité gained international status. Invited to Franceby his friend Maurice Cimalando, Habib Koité recorded two titles. The first one, in 1991, “Cigarette A Bana,” was a huge commercial success and made him a pop star in Western Africa. The second recording, “Nanale,” brought him the Discovery Prize of Radio France Internationale (RFI) in 1993. This official recognition, which came with greater media exposure, as well as his introduction to Belgian producer, Michel de Boek, allowed Koité to participate in his first tour outside of Africa beginning in 1994. His first album, Muso Ko, in 1995, and his second one, Ma Ya, in 1997 made his worldwide reputation even greater. Some of the songs from the latter album remained on the World Music Charts Europe for three months and the American Top 20 World Music category for 20 weeks. This broader exposure led to his first American tour in 1999. He was also the special guest of the group Art Ensemble of Chicago (Illinois) during their European tour in 2000 and in 2001 he appeared on the Late Show with David Letterman. In 2002 he won the Kora prize for best Western African artist. Between 1995 and 2001, this international success allowed Habib Koité to give no less than 560 concerts in 30 countries. In 2001 Habib Koité released the album Baro in which he targeted the Spanish-speaking audience by interpreting “Cigarette A Bana” in their language. In 2003, he participated in Martin Scorsese documentary on Blues music, From Mali to Mississippi, that traced the roots of the blues to Habib Koité’s adopted country. In 2006, Koité met the French director Michel Jaffrennou during the filming of the documentary Desert Blues, which led them to create two multi-media shows, the scenic adaptation of Desert Blues in 2006, and Kirina, l’Opéra Mandingue in 2008. In 2007, his new album, Afriki, was followed again by a series of a hundred shows in 25 countries. His most recent album, Brother in Bamako, in 2012, with the American Bluesman Eric Bibb, generated more North American tours that continued to enhance Koité’s career as the major worldwide figure in Malian music. “Habib Koité, le griot modern,” Habib Koité official biography, 2006, http://habibkoite.com/index2.php?page=biographie; David Hecht, “An inspired outsider, even in his own land,” New York Times, November 26, 2000, http://www.nytimes.com/2000/11/26/arts/music-an-inspired-outsider-even-in-his-own-land.html; “Habib Koité,” RFI Decouverte, October 2013, http://musique.rfi.fr/artiste/habib-koite/biographie; “Habib Koité’s biography,” Cumbancha, 2008, http://www.cumbancha.com/habib-koite-biography-eng/.